The Defence Secretary has reportedly said he has “very deep concerns” about Chinese firm Huawei being involved in upgrading the UK’s mobile network. Gavin Williamson’s comments – reported by the Times – came after some nations restricted use of the firm’s products in 5G networks over security concerns. MI6’s head recently said Britain faced decisions on Chinese ownership of tech. 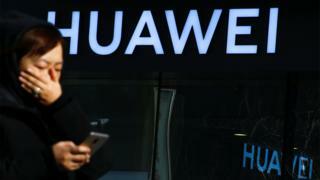 Australia, New Zealand and the US have restricted use of Huawei technology in 5G mobile networks, and Mr Williamson said the UK would look at their example. “We’ve got to recognise the fact, as has been recently exposed, that the Chinese state does sometimes act in a malign way,” he added. Huawei was founded by a former officer in the People’s Liberation Army but the company denies having any ties to the Chinese government, beyond complying with tax laws. The firm has strongly rejected any suggestion that it poses a security threat, saying it has “never been asked by any government to build any backdoors or interrupt any networks”. Earlier this month, MI6 chief Alex Younger said the UK needed to “decide the extent to which we are going to be comfortable with Chinese ownership of these technologies”. This week it confirmed that Huawei equipment was being removed from the heart of a communication system being developed for the UK emergency services, although it was not explicit as to why. UK Foreign Secretary Jeremy Hunt described the men’s actions as “one of the most significant and widespread cyber intrusions against the UK and allies uncovered to date”.